Same guys, same weapons, except Goliath didn't die the first time. Who do you pick in the rematch? If Goliath is really as tough as it says he is, then surely he'd squash David in the rematch. 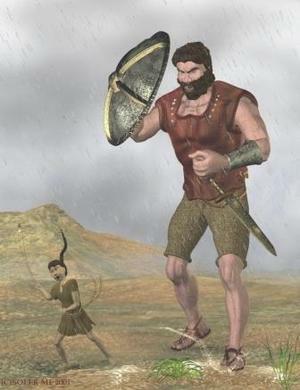 Goliath would have better tactics, and go for the kill right away. No way do you let a guy hit you with distance weapons. David is just totally badass, though. Even if he couldn't repeat the slingshot maneuver a second time, he seems awesome enough to try something new. Atomic missiles? Dig a really big ditch and lure Goliath in? I am sure David would work something out. it's true, and I love an underdog.